HUAWEI's best-in-class products have been lauded by EISA members, who represent expert media across the full sphere of consumer electronics. Starting with the HUAWEI P6 in 2013, the HUAWEI P Series has been awarded "Best Consumer Smartphone" for four consecutive years, thanks to a combination of impressive specifications, beautiful design and natural user interface. 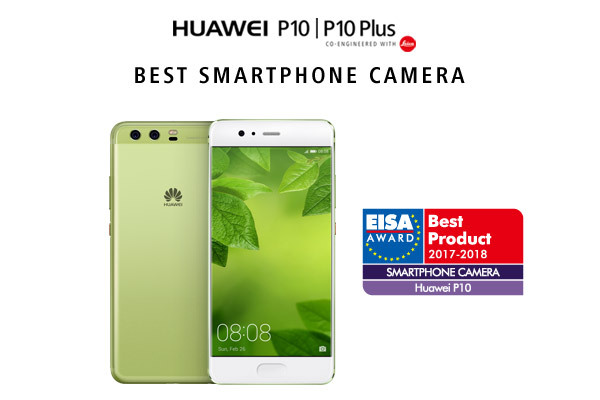 In 2017, the HUAWEI P10 has received special recognition for its camera experience, co-engineered with Leica, taking the title of 'EISA Smartphone Camera 2017 - 2018'. The HUAWEI P10 builds on the outstanding user experience synonymous with the P Series by providing users with everything they need to express their creativity through photography. At the heart of this are the latest rear-facing Leica Dual-Camera 2.0 and Leica-powered front-facing camera. These are combined with a full suite of cutting-edge software tools such as 3D facial detection and dynamic illumination to create timeless portraits and exceptional pictures, whatever the subject. The HUAWEI WATCH 2 exhibits the same commitment to design and functionality. Light and comfortable to wear, it provides users with the tools to live a connected lifestyle without compromising on style. Underneath the elegant, ceramic bezel, usually only found on high-end wristwatches, the HUAWEI WATCH 2 is packed with a raft of features designed to support an active and healthy lifestyle. Independent 4G connectivity, as well as support for Bluetooth and GPS, make it the perfect companion when working out. Glory Zhang, Chief Marketing Officer at HUAWEI Consumer Business Group commented, "Central to the HUAWEI philosophy is the tireless pursuit of meaningful innovation to create products that users all over the globe will love. 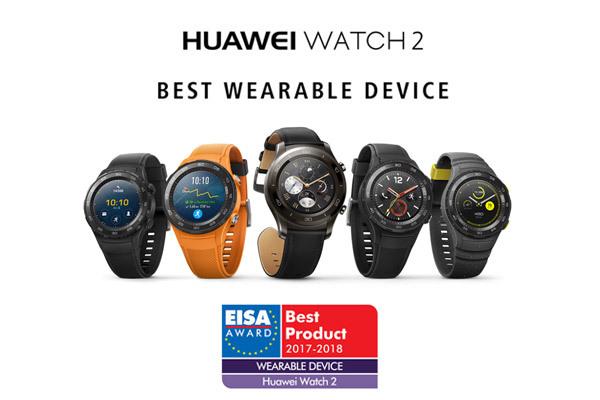 We are thrilled the HUAWEI P10 and HUAWEI WATCH 2 have been honored by such a prestigious group as EISA. From smartphones to wearables and everywhere in between, we will continue to push the limits of technology and design to create experiences that intelligently connect people with the things that matter most to them." Whether you're looking for a classy-looking timekeeper or a useful sports partner, HUAWEI's WATCH 2 is the one. Coming in both classic and sport versions, this smart watch is fully self-contained thanks to its integrated 4G connectivity. The ceramic bezel and customisable faces confer a style for every occasion. Equipped with GPS and heart rate monitoring, it is perfect for your daily workout, and its clever apps – along with Google's Assistant – come in handy everyday. The crystal-clear 1.2in circular AMOLED screen, built-in water resistance and two-day battery life make it a great companion wherever you go. HUAWEI's latest flagship is an improvement in almost every respect. Starting with its design, including a diamond cut chassis and brave new colours, through to the faster and more secure Kirin 960 Octa-core chipset, and finishing with the shining star - the Leica-branded cameras. The dual system on the back of the HUAWEI P10 now has a 20 million pixel monochrome sensor, and a 12 million pixel colour sensor, enabling the introduction of a brand new Portrait mode for stunning portrait photography. On the front is an 8 million pixel F1.9 selfie camera, also supporting the portrait mode and including Leica technology that is smart enough to recognise if there are more people in the picture, and consequently make the shot wider. For an even more professional photography experience, EISA recommends the HUAWEI P10 Plus. HUAWEI's products and services are available in more than 170 countries, and are used by a third of the world's population, ranking third in the world in mobile phone shipments in 2015. Fifteen R&D centres have been set up in the United States, Germany, Sweden, Russia, India and China. HUAWEI Consumer BG is one of HUAWEI's three business units and covers smartphones, PC and tablets, wearables and cloud services, etc. HUAWEI's global network is built on 20 years of expertise in the telecom industry and is dedicated to delivering the latest technological advances to consumers around the world.